Fill out the form or call 1-800-450-5319 for a FREE quote and information on A1 Overseas International’s auto shipping services to Turkmenistan! Whenever you are in need of international auto transport, contact A1 Overseas International for assistance. They have the relationships, experience, equipment and other qualifications to assure a secure transport to Turkmenistan. The auto import and export policies for the country are to be met or import into the country will not be permitted. This is another matter that the international shipping company will be happy to help with. The best and nearly the only way to conduct an auto transport internationally are with the support of overseas transport experts. They will help you gather the documents asked for by Customs in the timeframe you are given to collect the proof. This will help tremendously. What Do I Need to Present to Customs? 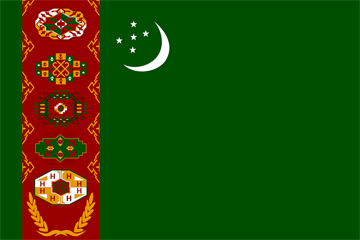 The policies for auto import into Turkmenistan and all countries are subject to change at any time. It is suggested that as the owner of the vehicle, you contact the Embassy of Turkmenistan months before the scheduled transport. This should give you enough time to collect what is necessary. There may be more or less documentation required to present to Customs. Give them anything they request so that you can obtain permission of operation from the Customs Department. This is the only way the vehicle will be allowed into the country’s borders. Fortunately, some of the documents should already be in your possession. The rest will require inspections and testing to assure the vehicle complies with Turkmenistan standards. Call 1-800-450-5319 or fill out the form for more information on boat, motorcycle and car shipping!